Kaanch Ki Gurya (کانچ کی گڑیا) is a new drama on Geo Tv expected to be aired from 30th March 2015 thus replacing currently aired Aap Ki Kaneez (آپ کی کنیز). After quite a gap, Faiza Iftkhari is writing a play. Sami Khan a must in Geo TV Dramas, is also in the cast too. A woman is just like a mirror… you can see yourself in her. Do you like what you see? 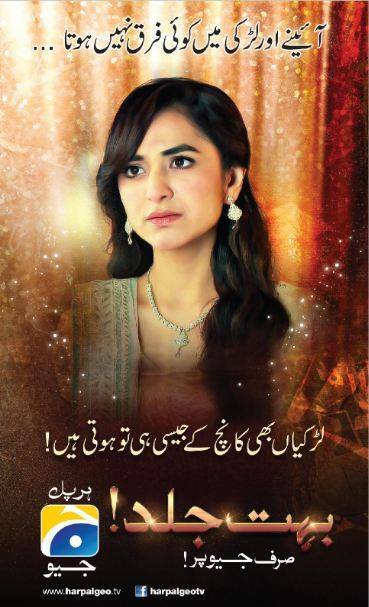 Here are the promos of this drama, backed by sensational, sentimental and emotional running commentary, another “unique” aspect of Geo Tv. Kaanch Ki Gurya’ is a beautiful plot of girls being like glass , so fragile and clear but they feel broken due to the hardships of life just the same way a glass is broken if fallen down… story revolves around a shattered girl who face the deprivations and sufferings of life just because she is an orphan. Manaal’s (Yumna Zaidi) mother is shown as a rich woman who decides to marry a poor man but unfortunately the parents die and leave her to the mercy of this cruel world. Manaal’s greedy aunt (father’s sister) send her to Manaal’s grandfather who is an industrialist, Manaal had to fight at every front to win her grandfather’s love … Daim (Sami Khan) is the adopted kid and lives with Manaal’s grandfather, he starts taking interest in Manaal.. Tragedy takes in fold when Grandfather (Qawi Khan) passes away leaving behind Manaal in an awful situation, Manaal has to go back and live with her greedy aunt who decides to get Manaal married to her crooked son to get hold of Manaal’s wealth… Will Daim get his love back? Will Manaal get married to her greedy cousin and live a life of misery? Kaanch ki Gurya proimises to keep its audience hooked every week.